Kick off your visit on the 2nd (Sun): take in nature's colorful creations at Dallas Arboretum & Botanical Gardens, then examine the collection at The Sixth Floor Museum/Texas School Book Depository, and then appreciate the history behind John F. Kennedy Memorial Plaza. To see maps, photos, where to stay, and tourist information, read Dallas trip planner. Use the Route module to find travel options from your starting location to Dallas. In September in Dallas, expect temperatures between 92°F during the day and 73°F at night. Finish up your sightseeing early on the 3rd (Mon) so you can travel to San Antonio. Pack the 4th (Tue) with family-friendly diversions at SeaWorld San Antonio. And it doesn't end there: take an in-depth tour of The Alamo, pause for some serene contemplation at San Fernando De Bexar Cathedral, contemplate the long history of Mission San Jose, and explore the fascinating underground world of Natural Bridge Caverns. To find reviews, more things to do, photos, and more tourist information, you can read our San Antonio journey builder app . You can fly from Dallas to San Antonio in 3.5 hours. Alternatively, you can drive; or take a bus. September in San Antonio sees daily highs of 94°F and lows of 73°F at night. Finish up your sightseeing early on the 6th (Thu) so you can go by car to Austin. Austin is known for museums, nightlife, nature, parks, and trails. 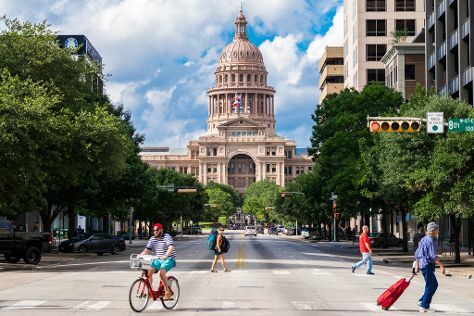 Your plan includes some of its best attractions: get a sense of history and politics at Texas State Capitol, take an in-depth tour of LBJ Presidential Library, contemplate the waterfront views at Barton Springs Pool, and take in the views from Congress Avenue Bridge / Austin Bats. To find reviews, where to stay, traveler tips, and more tourist information, use the Austin trip itinerary website . Getting from San Antonio to Austin by car takes about 1.5 hours. Other options: take a bus. In September, plan for daily highs up to 93°F, and evening lows to 71°F. Wrap up your sightseeing on the 8th (Sat) to allow time to take a bus back home.